A bunch of pretty flowers and a thoughtful card with an inspiring verse. It may not not seem like much but sometimes it is just enough. A perfect Mother's Day present, for someone who can't have much and is grateful for so little. And stopped me running wild. By the things you say and do. I never would have come this far. The debt I owe to you. It was a good day to deliver the card and flowers. A day that saw her looking well, in wonderful form and knowing exactly who everyone was. A visit so precious that you hope it doesn't slip away with the sands of time. She may not be able to read the card, or to understand it's sentiments, but I know she'll carry both her Mother Day's cards around with her, in her infamous red handbag, for the weeks and months to come! My Mam has been a wonderful Mother and thanks to her we are the people we are today. If I do half as good a job with my boy I will be a very happy Mum indeed. Although, I may have to wait a very long time before I get a card like this. Or indeed any kind of card at all. 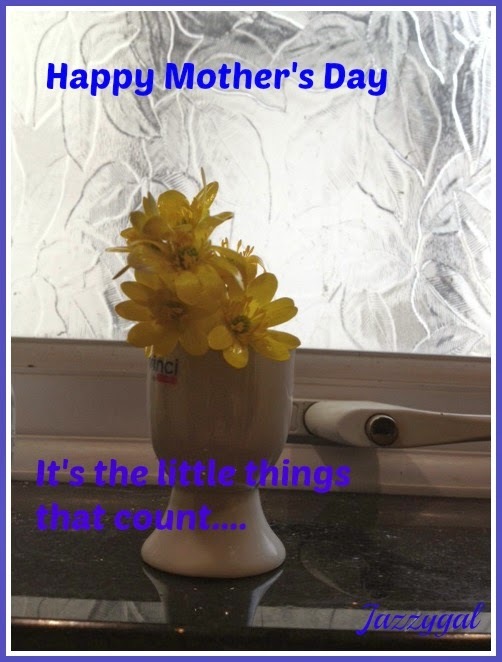 Mother's Day does not feature highly in the house of 'Hallmark Day' detractors and ASD-ness. It's a Sunday just like any other, when Gaming and Golfing trumps all. Or so it seems. A Mum is many things you know; she is thoughtful and caring, worrying and fretting over issues of concern, all the while ensuring that her family is nourished, with both food and love. She is also no fool and is always resilient and well prepared. And if Mother's Day doesn't come to the Mamma, then the Mamma will have to make it her own. She can throw a bit of a strop - some revenge tantrumming maybe? - and gain herself a hastily picked bunch of tiny flowers from the garden in her favorite colour - yellow, just so you know; that currently sit prettily, in a very glamorous white egg cup! And there is nothing wrong in pre-empting things by treating yourself to a little something from Marks and Spencers - a spot of Vichy products too perhaps? - in the week leading up to the day now, is there? And a trip to a local restaurant on the day with your secret date of yore - who has grown up quite a bit since then - can't do any harm at all now, can it? The fact that they serve wine is just an added bonus. Besides it's the unexpected showering of hugs, the impromptu moments of gratitude, the open and positive relationship you have, being trusted implicitly and being the one they turn to in their hour of need, on any day of any week, that makes it all worth while. And the best gift of all today was seeing my mam in such good form. Happy Mothers Day to all you wonderful Mums out there. Awww Val. I live with a Hallmark denier. But he does buy champagne. Sounds like you had a perfect Mother's Day regardless! We all have our own ways of enjoying things and that's for sure! I am so glad you mom was having a good day on such a day. Lovely post. Loved that poem. Might put it on something to my own mum on another random day of the year! She loves soppy stuff! I'd be so touched if I got that on my card. My six year old made me a lovely card at school and although I had a lovely day, that was all I needed! @Midlife Singlemum: The best treat! Wow, that's a very beautiful poem! Thanks for sharing that. Actually I'm looking for inspiration in writing Mothers day messages for this coming mom' day and this truly inspires me. Thank you.